Kitesurfing holidays in Essaouira, Morocco? Place is not that big, but there a few pretty good kitespots here. Well worth the visit. Maybe Essaouira, this little Moroccan kitesurfing gem is one of the less known kitespots, but it surely is well worth the visit, not only thanks to its long sandy coastline and fairly consistent winds, but also for its rich history and ancient sights. As its name declares, the “little rampart” is a picturesque old town, which has been there as a meeting point for European, African and Arab people for more than 2500 years. It’s pretty easy to get there, especially from Europe and there are several flights a week from wherever you may be. It is relatively cheap in comparison with other kitesurfing holidays and destinations, plus you don’t need a car to get around. Pretty much everything is within reach, so just to save a buck. Or get a camel like the locals. The beach is only 10 minutes away from the old town, where most hotels are. Moreover, local kiteschools organise transport and daily trips to further spots, so that’s pretty handy and in case you need to go anywhere else, there are also the local blue taxis. If you are visiting Tarifa in Spain for kitesurfing holidays by any chance and want another fancy stamp in your passport, you should book a place in Essaouira for the night or two and go check it out. Well worth the visit and easy to get to. There are several ferry boats leaving Tarifa to Tangier in Morocco few times a day and from Tangier to Essaouira it's just an easy costal trip. Check out this spot guide with the best kitespots in Tarifa. As for the weather conditions, the wind mostly blows from the east, especially during the summer months, when it occasionally increases up to 40 knots, although it usually stays consistent between 15-25 knots. The direction changes depending on the part of the bay you choose, but if you're taking lessons, the local kiteschools obviously prefer the areas with the onshore wind, safer for beginners. As for the waves, they vary from flat to spectacularly high, so if you do surf, you'll have fun. It is also better to wear full wetsuits, as the wind might get pretty chilly sometimes and water could be freezing! 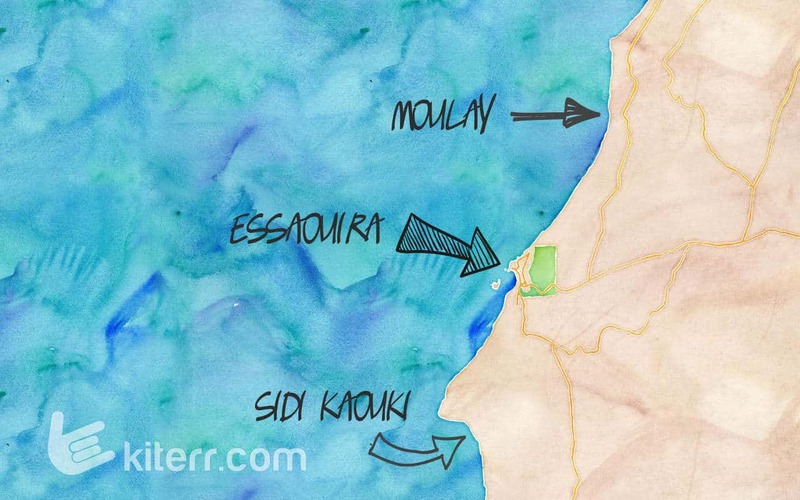 Apart from the main beach in Essaouira, you can check those of Moulay, about a 20-minute drive away to the north. Quite a small sandy beach, but a great kitespot with the perfect waves. From March to June, perfect spot for the surfers and kitesurfers with the waves around 1.5 up to 3 meters high. An alternative would be Sidi Kaouki, a wave spot at the same distance but to the south. Sidi Kaouki is a large open sandy beach with pretty reliable, but offshore winds blowing from the south. You may need to be extra careful here with the rocks. It would be a pity if you leave Essaouira without exploring its medina (“old fort”), checking its colourful markets and the bargains you can find there, testing the traditional dishes of the local moroccan cuisine and – why not? – riding a camel! So that’s for the days when it doesn’t blow or you just need to take a little break. Keep in mind that Morocco is a Muslim country, and, as such, there are certain rules you should respect. Rude behaviour, titting out on the beach and especially drinking around, especially during Ramadan is simply (and understandably) unacceptable.